I'm a writer, but I've been involved in most other forms of communication, as well. I bring not only writing skills to bear on your project, but also an awareness of its context, grounded in my graphic arts experience. I wrote the documents linked below and also designed most of them using any of several software applications. These include Adobe PhotoShop, several MS Office apps, Corel Ventura, CorelDraw, Corel PhotoPaint, Adobe Coldfusion Server, Adobe Dreamweaver, Adobe Captivate, Photodex ProShow Gold, or a combination of them. State Telephone Directory - (570KB) This document combines lots of graphics with a listing of state government employees. I created SQL queries to produce text files with embedded layout and forrmating codes that were then imported into DTP software. The formatting was controlled by a separate style sheet. ITS Annual Report - (224KB) Managed the entire project, including gathering all inputs, providing all graphics and layout, and publishing. ITS Education Course Catalog - (865KB) Educational Course listings were produced from a database in a similar fashion to the State Telephone Directory. Provided all graphics, scripting and page layout, as well as managed printing. Pinnacle Newsletter - Feb 2011 - (140KB) Created design for newsletter, contributed all pictures, writing, and editing for all articles. (1.4Mb) "Use Flash to Improve, Not Overpower, Your Image" I contributed this Technical article, which begins on page 5 of the PDF, to the PRISM. the quarterly newsletter of the Photographic Society of Northwest Arkansas, with a membership of 350. PSNWA Chairman's Letter - May 2011 -(1.6Mb) As Chairman of PSNWA, I was given page 2 of the PRISM newsletter each quarter. I also provided the cover photo for this issue. PSNWA Chairman's Letter - Sept 2011 - (1.6Mb) As Chairman of the Photographic Society of Northwest Arkansas (PSNWA) for three years, I was given a page of the quarterly newsletter, the PRISM, to communicate with the Society's 350 members. The message begins on page 2. Posts from my blog giving writing advice to people in corporate settings. The goal was to promote simplicity in both style and content. Excerpt from Asset Mgmt Training Video - Produced using Adobe Captivate. I also provided the voice narration. The clip is about 2-min long. Shooting Strategies - 2Mb PDF - This was a PowerPoint overhead presentation designed to cover an hour-long class. Part of the Five-Minute Photo Class series of audio tutorials. Script, voice and recording by John Allred. Part of the Five-Minute Photo Class series of audio tutorials. 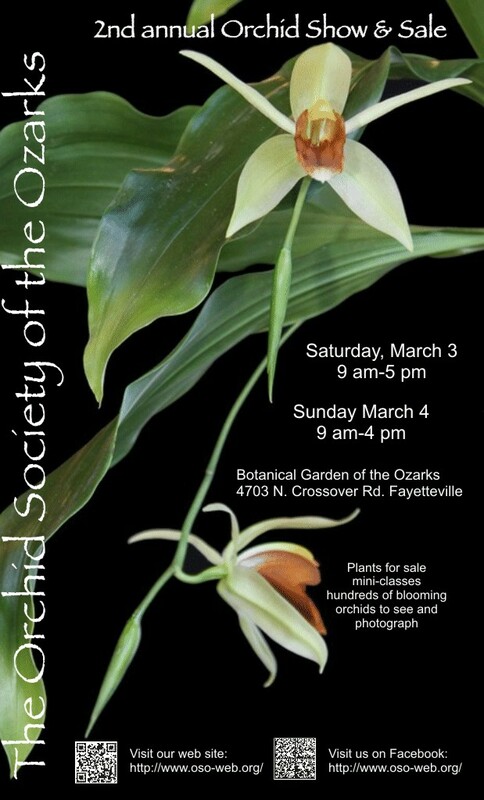 Orchid Society of the Ozarks event poster. Dale Carnegie Assistant Guide - (266KB) This is partly a recreation of other materials owned by Dale Carnegie Training. With permission, we made additions and changes to it for assistants in our internal, corporate classes. Additional samples of vector graphics available on request.